Photo by Smiley Eyes Photography. When Alberta Wilbert Sales (AWS) started out in 1967, it was a one-man operation dealing in funeral vaults for northern Alberta. During that first year, sales were only $35,000 and the company lost money. Thankfully, the one man in the operation was Leonard Traub. He quickly recognized some changes were needed in order to make his vision a success. “I thought I had to find something else that was going to work better than this, so having made septic tanks and burial vaults in the States, I decided to do that here,” says Leonard Traub, founder and owner of AWS. Traub added tanks to his catalogue and continued to grow and add more and larger products over the years. He bought five acres of land at 170 Street and 129 Avenue in Edmonton in 1970, giving him the space to engineer round holding tanks and water cisterns through the mid-1970s. As the company grew, the site expanded to accommodate that growth. Today, the Edmonton facility sits on 12.5 acres and houses two plants and the head office that sprawls over 90,000 square feet. 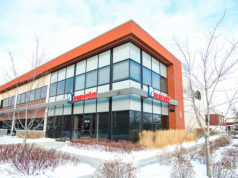 The company has expanded to include a tank location in Penhold, a burial vault satellite in Winnipeg, and an office, tank yard and burial operation in Calgary, as well as distributors in Lethbridge and Grande Prairie. 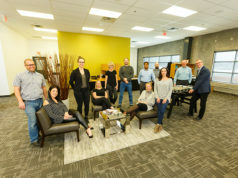 The one-man operation now employs about 70 people and is one of the largest independent concrete precasters in the Prairies and the largest Canadian territory in the Wilbert franchise network. Traub is the only founder in the Wilbert organization still active today. The keys to this success are simple – providing quality products and exceptional service. AWS prides itself on making superior products and exceeding industry standards to ensure its customers are getting the best value. Rather than creating different concrete batches for the tanks and vaults, AWS just uses the best batch for all its products. While vaults need to have a compressive strength of at least 5,000 pounds per square inch, AWS vaults exceed 6,500. Traub also wanted to ensure quality throughout the industry and was instrumental in introducing CSA for septic tanks in Alberta to establish a standard. He also served on the CSA board for more than 20 years. “A contractor friend and I were instrumental in helping to establish the predecessor to what is today the Alberta Onsite Wastewater Management Association. Presently, it’s the voice of the installers,” he says. Over the past half-century, he has worked to not only strengthen the industry but to grow his company to better serve the needs of the market. To do that, AWS has stayed abreast of the latest technology and equipment, from computer design systems that help create the best tanks to the largest truck-mounted cranes. Truck-mounted cranes are critical in this business. The manufacturing facility needs cranes that are big enough to handle the huge products the company manufactures. With lifting capacity of around 30,000 pounds and space to grow, the sky is the limit for AWS. It manufactures tanks ranging from 350 up to 5,600 imperial gallons and can customize a product to specific needs. 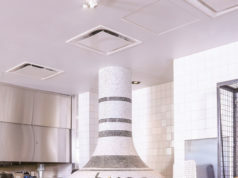 These individual units can then be connected to create larger systems for clients. “We added some bigger tanks and then came in with septic tanks that we call rinktop tanks, which are rectangular tanks with rounded corners to eliminate the weak point on the square corners,” says Traub. The company pours all products indoors to ensure Alberta’s climate doesn’t adversely affect the quality. It also manufactures everything upside down, ensuring air doesn’t get trapped in the concrete, thereby keeping the product water-tight. Being a largely seasonal business, most sales come between spring and fall but AWS manufactures year-round. It carries $4 to $5 million in inventory on the lot at any given time. A good concrete tank made this year, and continually curing, will be even stronger next year when it is sold. AWS has a reputation for being the best, which means customers are happy but it doesn’t lend to repeat business. “When I started in business, a competitor in Calgary said ‘Leonard, why would you make a septic tank so good you’re only going to sell one?’ And, actually, we only sell one. That’s why we are mainly a wholesaler to contractors,” he says. AWS has very limited retail sales and instead caters directly to contractors and funeral directors. That way the company has access to all of the contractor’s customers rather than just one individual retail customer. If a retail customer needs something small, like a replacement pump, AWS is happy to oblige but will protect contractor pricing to maintain that relationship. Relationships are important to Traub and his management team. The company-wide policy is people come first – clients, suppliers and employees. Some customers have been dealing with AWS since the beginning and some staff members have been with the company for more than 30 years with many being second-generation employees. “I was employed for a number of years before starting this business. I know how I wanted to be treated,” he says. That’s how he treats his staff. The work environment is supportive, respectful and friendly. People work hard but they enjoy the job and are appreciated for it. 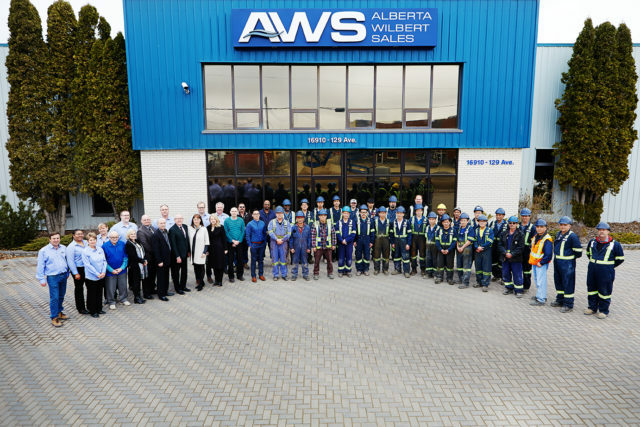 The family atmosphere keeps employees happy, and AWS enjoys little staff turnover. Employees are well trained both in the technical and the service aspects of their jobs. AWS is committed to delivering products on time every time. This comes from its roots in burial vaults, where being late is not an option. “You can’t be late for somebody’s funeral, so we are not late on deliveries on any of our other products either. Our service is second to none,” says Traub. The level of service AWS shows has even changed how competitors do business. Customers know deadlines will always be met with AWS and they demand the same from other companies as well. Employee conduct on site and in the office is held to a high standard as well. Traub credits the staff, past and present, for the company’s solid reputation and growth. His advisory board of Paula Ierullo in Calgary, and Bob Demco and Dave Dallaire in Edmonton, handle the day-to-day operations while Traub enjoys the perks of being semi-retired. He is confident he has the right people in place to lead AWS into the future. That future may see the company moving toward more commercial and municipal infrastructure work, and they are looking at setting up a distributor in Fort McMurray to help that community rebuild. They also have an eye on expanding the Calgary branch and introducing more products under the AWS umbrella. For the past 50 years, Alberta Wilbert Sales has provided the West with quality products and amazing service. With knowledgeable advisers in place who embrace Leonard Traub’s philosophy of quality and commitment, the company is poised to carry on for another 50. Next articleHow is Edmonton’s Travel and Tourism Industry Doing?